About one hour (30 pages) of Christmas Music arranged for Choir, Soloists, Piano/Organ, Congre-gational participation and suggested readings for a Narrator. Includes: Once in Royal David's City; Comfort Ye; How Bright Appears the Morning Star; Behold; Come Thou Long Expected Jesus; Break Forth, O Beauteous Heavenly Light; Glory to God; Let Us Go; Pastoral; Angels from the Realms of Glory; O Holy Night; O Come, All Ye Faithful. Subject: Sheet Music for Choir S.A.T.B. C. Van Dam in Clarion: This CD of instrumental hymns will quickly become a family favourite. The music is of a very high quality and the selections played are bound to have a wide appeal (e.g., Genevan, traditional and more modern hymns, as well as some classical such as Handel, Purcell and Mozart). 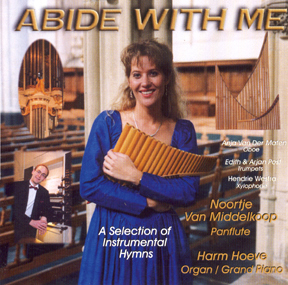 The sensitive opening solo selection, "Abide With Me", by Noortje Van Middelkoop on the panflute is superb and sets the right tone (pardon the pun) for what follows. Together with Harm Hoeve on the organ, this duet brings to new life and vigour tunes one may not have been aware had such potential for sparkle and appeal. Some of the selections also involve Anja Van Der Maten playing the oboe, Edith and Arjan Post with trumpets and Hendrie Westra on the xylophone. All in all a very delightful and uplifting recording which I hope will be enjoyed by many in our midst. In an age of much trash music, a CD such as this needs to be heard in our families. May it also be used to build appreciation for good music. Abide With Me (Eventide); I Love The Lord (Genevan 116); As a Deer Pants For the Water; Praise the Lord With Drums and Cymbals; With All My Heart (Genevan 138); All Through the Night (Old Welsh Air); Interludium: Prelude in Classic Style; I Need Thee Every Hour (Need); Our Faithful God Makes Plans (Gregor's 112th Metre); Abba Father; Alleluia; Yerushala im Shel Zahav; Trumpet Voluntary; Greensleeves; Great is Thy Faithfulness (Faithfulness); The Lord's My Shepherd (Crimond); There is a Redeemer; Praise Be To The Lord (Rule Britannia); Abide With Me (Eventide). This Dutch DVD (PAL) can be played on most computers but NOT on all North American (NTSC) Television sets! J. Zwart: Toccata on Psalm 118; G.F. Handel: Arrival of the Queen of Sheba; G.F. Handel: Air (from Watermusic); J.S. Bach: Toccata in F, B.W.V. 540; J.L. Krebs: Trio in F; C.H. Rinck: Variations on Psalm 42; H. Hoeve: Chorale Prelude Psalm 116; H. Hoeve: Glory be to God the Father; etc. God of our Fathers; All Creatures of Our God & King; Psalm 116; Songs of Israel; Concerto for Two Manuals; Thine is the Glory; etc. 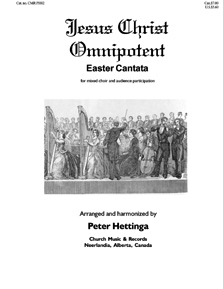 Carl Oosterhoff in Reformed Perspective: The program is of a popular character: there are not long, musically profound compositions which might possibly bore the musical layman. Rather, this recording features attractive Psalm and Hymn arrangements as well as popular, easy listening music from the Romantic, Classical, and Baroque periods. 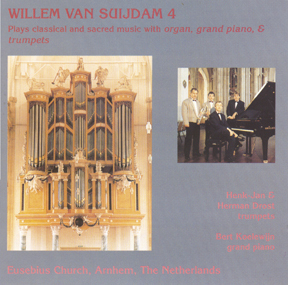 On September 7, 2002 the Dutch Reformed Men's Choral Society, directed by Freddy Veldkamp, with Harm Hoeve at the organ, gave a concert in Edmonton, Alberta, Canada. A live recording was made and will be included, free of charge, with any order for the C.D. Gouden Koorklanken. Largo - Handel, Bourree - Handel, Cantilena - Rheinberger, The Londonderry Air, Roumanian Air, Abide With Me, Arioso - Handel, Melodie in F - Rubinstein, Air - Handel, Traumerei - Schumann, Siciliano Air - Telemann, Standchen - Schubert, Entra'acte Gavotte - Thomas. Only available on 12" LP Record Album. Holy Holy Holy, All Through the Night, Adagio Cantabile - Beethoven, Fantasie on Christmas Carols, Erbarme Dich - Bach, I Will Sing of My Redeemer, Daarboven Juicht een Grote Schaar, Melodie in F - Rubinstein, The Old Rugged Cross, etc. Only available on 12" LP Record Album. 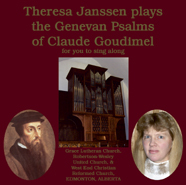 This CD includes two of the greatest Dutch organ works, composed by Cornelis de Wolf: Psalm 33 & If You But Let the Father Guide You; It also includes Gert Oost: Psalm 92; Bastiaans: Jesu Meine Freude; Cor Kee: Psalm 43. Live Concert with Orchestra accompaniment and Harm Hoeve, Organ. Now Let Every Tongue; Sanctus; Thou Shalt Know Him; God Be In My Head; Zion Lift Thine Eyes; Longing for God - Psalm 63; My Heart is Inditing; Upon Thy Right Hand did Stand the Queen; The Lord's My Shepherd, I'll Not Want; God So Loved the World; O Sacred Head, Now Wounded; All People That On Earth Do Dwell; Holy Art Thou; Let Thy Holy Spirit; Sound the Trumpet; Holy, Holy, Holy; An Irish Blessing; etc. Includes one of each of the 150 Psalms, sung by the Dordt College Chorale and Choir. Accompanied by various organists and the Dordt College Concert Band. Directed by Dale Grotenhuis, Gerald Bouma, and Henry Duitman. Psalms 136, 134, 95, 68, 146, 113, 51, 32, 16, 110, 80, 22, 60, 63, 84, 139, 121, 116, 91, 5, 86, 78, 19, 47, 76, 149, 67, 24. Psalms 117, 147, 138, 148, 8, 150, 46, 124, 103, 15, 27, 25, 34, 38, 42, 129, 106, 89, 1, 23, 37, 119, 90, 127, 128, 87, 133, 66, 72, 98, 100. The Hymns Album  An hour of well-known hymns sung by the Huddersfield Choral Society. O Worship the King; Praise My Soul the King of Heaven; The Lord's My Shepherd; O Sacred Head; When I Survey the Wondrous Cross; Christ the Lord is Risen Today; Abide With Me; Crown Him With Many Crowns; Hallelujah Sing to Jesus; God So Loved the World; Guide Me O Thou Great Jehovah; Eternal Father Strong To Save; The Day Thou Gavest Lord Is Ended. Glorious Things of Thee Are Spoken; Jesus, Priceless Treasure; Stilling the Tempest; Come Thou Fount of Every Blessing; Sion Hears the Watchman Singing; From Whom All Blessings Flow; O Jesus Grant Me Hope and Comfort; etc. The recent release of a DVD of this beautiful music, also performed by Choir of King's College, Cambridge, England, caused several customers to request a CD version. This 1973 recording remains one of the best performances of Handel's best known masterpiece. It is a must have in every home! the same choir was Can. US$44.99 but is no longer available by itself. Four Compact Discs with selections from the Psalms composed by one of the greatest composers who ever lived: Handel! Dear Lord and Father of Mankind; Love Divine, All Loves Excelling; Praise to the Lord, the Almighty; All My Hope in God is Founded; For all the Saints; etc. Chorale Preludes by Harm Hoeve on Psalm 43 & Praise My Soul & Take My Life; Also music by Bach, Handel, Guilmant, Walther, Boyce, Soler, Bonset, Boely, Grison, and Asma. Our favourite Feike Asma CD. 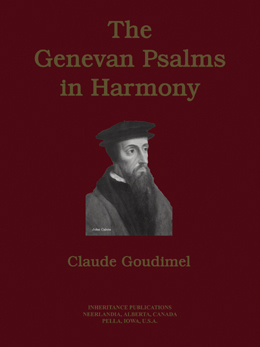 Includes Psalms 84 & 92 of Jan Zwart; Psalm 25 of W.H. Zwart; Psalm 43 & Komt als Kind'ren van het Licht & the Evensong of Feike Asma. Psalms 138, 101, 68, 134 (Old 100th), 117, 98, Song of Simeon, etc.